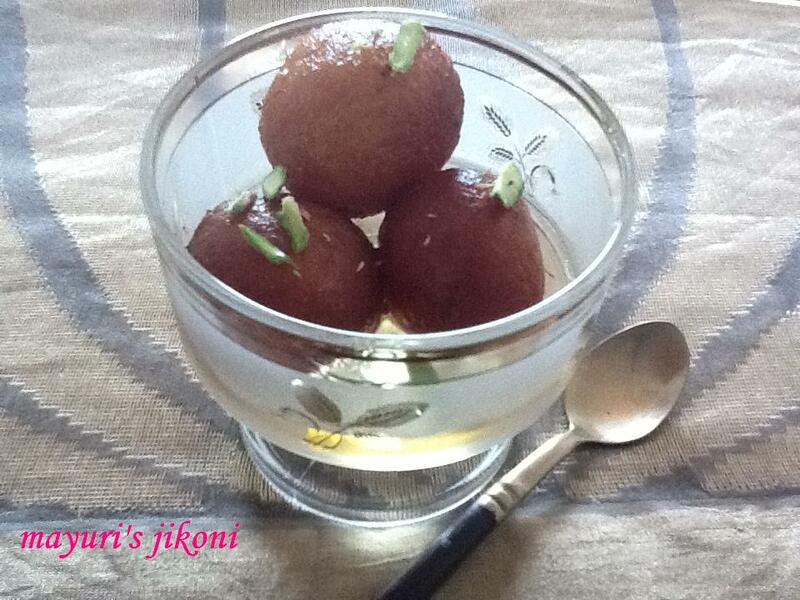 Gulab jamuns are sweet doughnut like balls floating in a sweet syrup. Gulab means rose and jamun is a fruit in India. The syrup is flavoured with rose water, kewra or saffron. It is said that the dessert gulab jamun originates from Afghanistan. However it is a common dessert or sweet dish in India and prepared widely for all occasions, be it festivals, weddings, birthdays etc. Usually I make gulab jamun using mawa or khoya which is milk solid. A few weeks back Sapna, my sister asked whether I could try out the recipe for gulab jamuns but using milk powder as khoya is not readily available in UK. I promised her I would since I had Pratibha bhabhi’s milk powder gulab jamun recipe in my book. It has been ages since I have made gulab jamuns. So as soon as I could lay my hands on some milk powder, I tried out the recipe with a slight change.I added a bit of yogurt to the recipe as soda bicarbonate requires an acidic agent for it to react to it fullest strength. The jamuns have turned out nice and spongy. So Sapna your turn to try them out. Use proper measuring cup and spoons for this recipes and all the other recipes on the blog. Soak the sooji in warm milk for 15 minutes. Mix sugar and water in a pan and put it on medium heat. When it begins to boil, lower the flame and let it simmer for 5 to 10 minutes. Switch off the heat. Add the saffron and cardamom powder. Sieve the milk powder, plain flour, soda bicarbonate and eno together into a mixing bowl. Add the cardamom powder. Rub in the ghee with your fingers. Add the soaked sooji and yogurt. Mix using a big spoon or spatula. At this point the dough will appear like a paste. Rest the dough for 15 minutes. Grease your hands and gently make a ball from the dough. By now you should be able to work with it. Don’t mix it too much. Divide the dough into 18 to 20 parts. Roll each part into a small ball. It should be about marble size. Be careful that there are no creases on the balls. Heat the oil in a wok or karai on medium flame. To check if it is just hot enough, drop a tiny piece of the dough in the middle of the oil. If it begins to sizzle then its ready. Drop the balls into the oil about 6 to 8 at a time depending on the size of the karai or wok. Lower the heat and keep on rotating the balls till they become golden brown. Remember to fry them over low heat. This usually takes about 5 to 7 minutes. Put the dumplings or jamun on a kitchen towel to drain out the excess oil. Fry the remaining balls. When all the jamuns are fried, heat the syrup again if it has become cold. When it is warm, drop all the jamuns or dumplings into the syrup. Let the jamuns soak up the syrup before serving. You must keep on rotating the balls while frying as you want them to be golden brown evenly and not on one side. Can add rose water to the syrup if you like. Add saffron to the jamun dough for more flavour. Can serve them hot or cold. The syrup should not be too thick. Simmer till its just about one thread consistency. I simmered it for 7 minutes and it was just right. Fry on low heat otherwise they will remain raw inside. Fry a few balls at a time as they will become double the size while frying. Make sure the syrup is not too hot when you drop the jamuns into it as the outer part may become chewy. I tried this and they did turn out delicious. I would put less sugar in the syrup as they were quite sweet the following day. I agree, use 1½ cup sugar with 1½ cup water.